It’s Thrift Store Challenge time again! 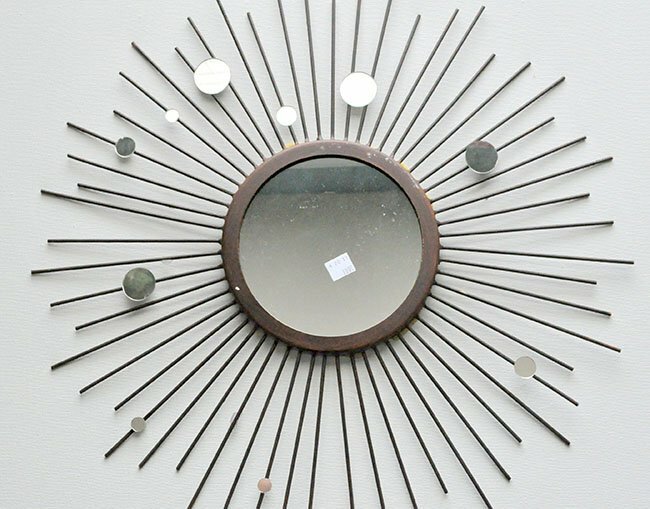 I found this old sad broken sunburst mirror that needed new life! 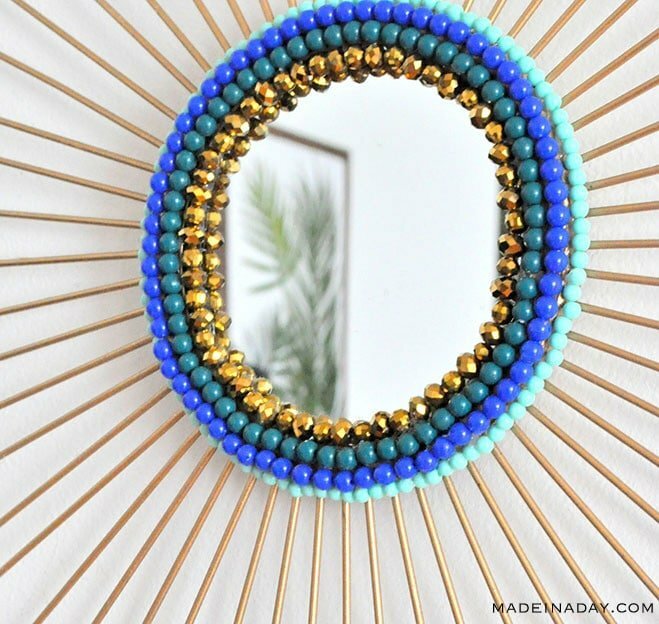 I have been seeing beaded mirrors popping up at places like West Elm, Wayfair and Pottery Barn. I knew I had to have one! 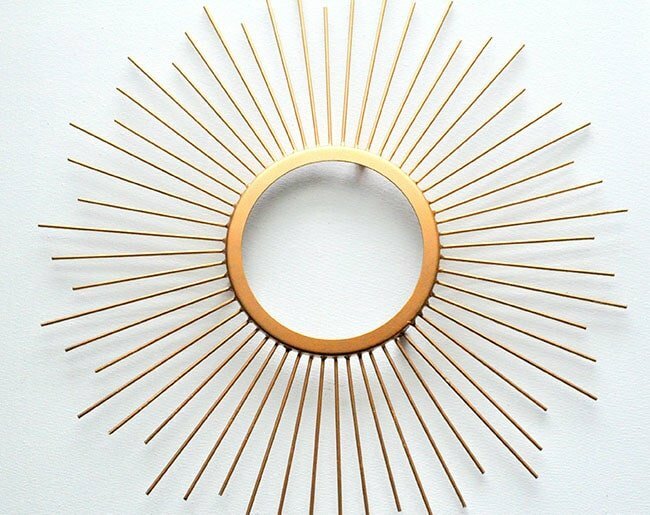 When I saw this sunburst I knew this could be a fun boho piece for my living room! Plus I didn’t have to DIY the base! Win, win! For this makeover I used some beaded necklaces I bought for crafts. You can find these sometimes at Walmart or dollar stores. They are great because you can get a lot beads in different sizes very inexpensively. You could also use party beads like the ones they throw in Mardi Gras or just string your own. Just find the ones where the beads are closely strung together. Here’s how I made it! 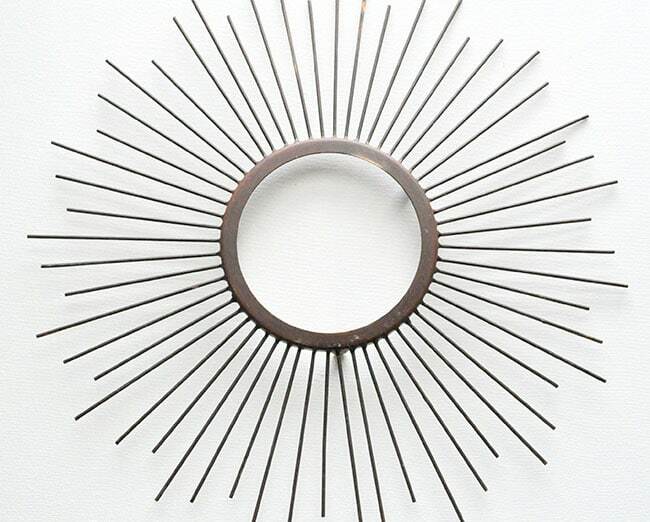 Take apart the sunburst mirror, remove the back and mirror if possible. If the mirror is not removable cover it in painters tape before painting it. Remove any embellishments and old glue. Use sandpaper to smooth out any imperfections. Paint the base with light coats of gold metallic spray paint and let it dry by manufacturers directions. NOTE: My beads were on already on strands. I cut one end, tied it in a knot and left the other end loose. I found having the beads already strung made gluing the strands to the edge of the mirror very easy. Gluing each individual bead would of made the lines uneven and would take a long time to get them straight. I also put the mirror back in the sunburst frame before adding the beads. Using hot glue start gluing the end of the strand of beads with the knot to the outer edge of the frame. When you reach the end, tie the end in a knot and glue it down tightly into place. I glued the gold strand in the center down onto the mirror. Clean up any stray glue strings with pliers and that’s it! This truly is a fun and unique piece. The gold in the center is the perfect pop. 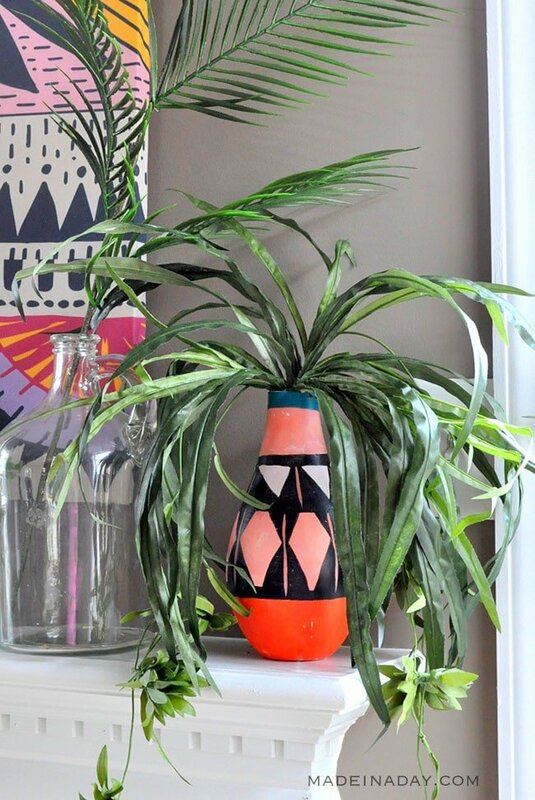 It’s hard to believe this $1.99 sad throw away could look so amazing! This is a fabulous upcycled project! I’ve got the perfect spot a mirror just like this in our master bedroom. I love the color of the beads you found. I seriously want to go thrift shopping with you. You find the best stuff for the best prices and make them amazeballs! 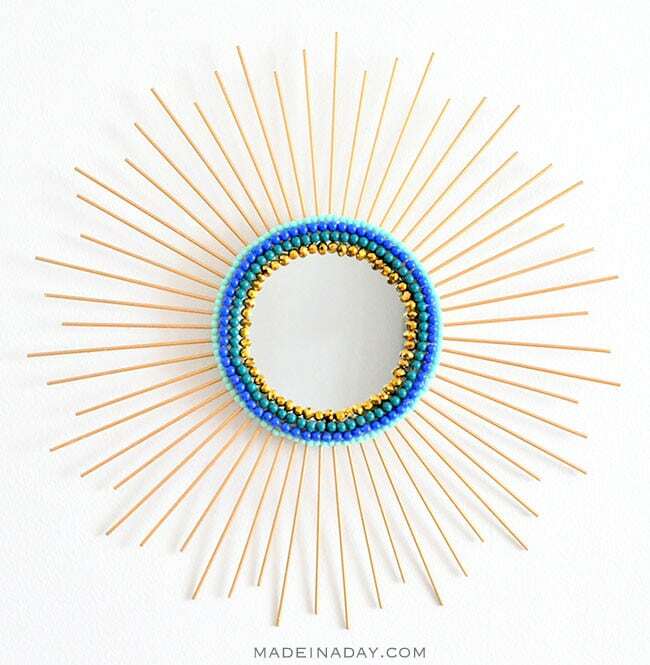 This beaded mirror is beautiful! I love the boho vibe! 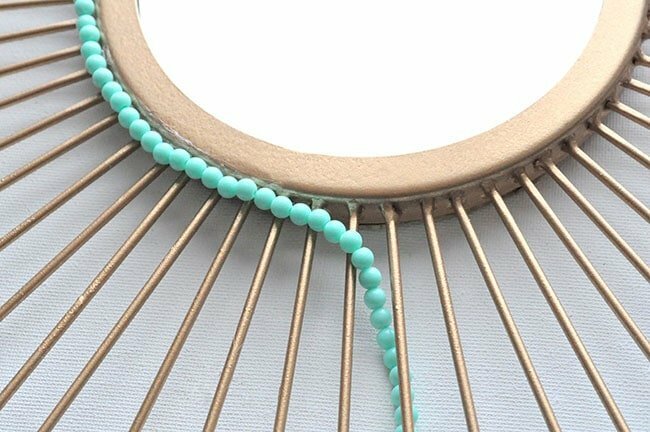 This is a cool upcycle — and you could use old bead necklaces, too! Ooooh, I love the up cycled version so much better! That gold is awesome, and the beads are perfect! I love how the gold AND the beads really changed it up! I’m totally going to keep a look out for a mirror like that. What a fun and stylish way to upcycle an old mirror. I love the color you chose for the sunburst. What a fun project. Love the gold paint. My mom used to have a starburst mirror like this….I wonder if she still has it hanging around! It would be a fun project for her screen porch! Thanks for the detailed tutorial! Your mirror looks fantastic. I bet those high-end stores you mentioned charge big bucks for a mirror like this. You did a great job, so creative. What a fun project. Love it. So much nicer ! Those sunburst mirrors tend to look cheap but this is such a great and creative improvement! I love the gold paint and the beads add some fun color! I haven’t seen the bead mirrors I better go take a peak. Nice job! Love your upcycled mirror! 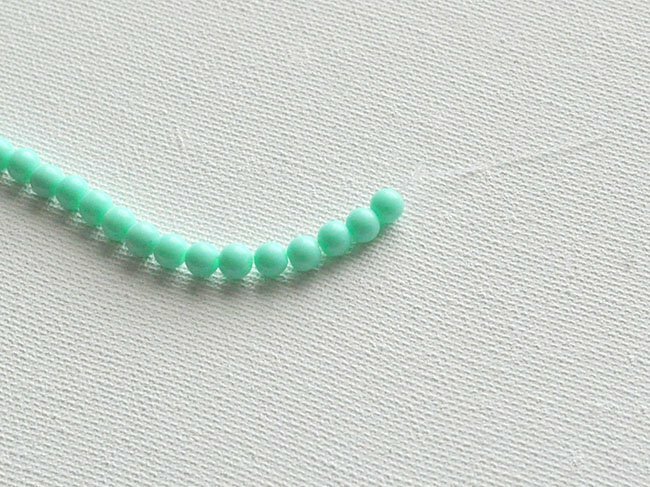 Also a great way to reuse bead necklaces which my kids have too many of. Visiting from Thrift Store Challenge. Thank you Victoria! I reuse old necklaces all the time. So much cheaper than buying beads. Kim – what a fantastic transformation! We love your creativity. The starburst mirror is so modern and colorful! Thanks ladies for the sweet comment. It looks so pretty in person, so sparkly!